Interested in finding out more about the local beer scene in New Orleans? It is an exciting time as the number of breweries in the city continues to grow with more currently in development. Join in on a journey through the best beers and breweries available on this Northshore Brewery Tour. All tours feature three stops and include samples at each stop. Stops will vary by day and include Abita, Covington, Chafunkta, and Old Rail. Tour pick-up will occur at the Avenue Pub on St. Charles Ave. Please arrive 10-15 minutes prior to tour start time of 12:00pm. 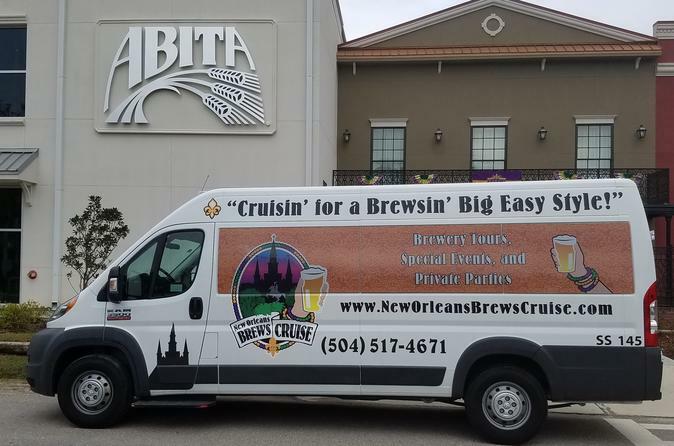 The tour will feature New Orleans historical tidbits during transit as well as information on the breweries being visited and the history of beer in New Orleans. Each tour will feature three brewery stops and includes at least one brewery tour and guided samplings at all stops. There will be time to taste additional beers and purchase brewery merchandise. Stops will vary by day and include Abita, Covington, Chafunkta, and Old Rail. There will be roughly one hour allotted for each stop. Food is available for purchase at most stops. At the conclusion of the last stop, the tour will return to the Avenue Pub for drop off and time for any additional questions and answers.